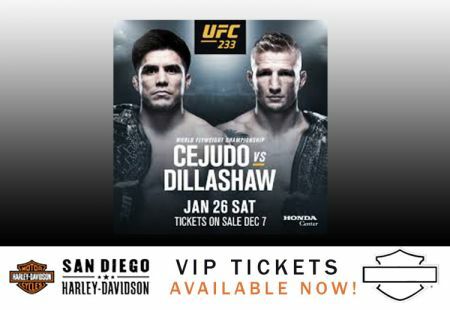 Enjoy UFC 233 in comfort at San Diego Harley-Davidson!! Our VIP room has leather couches, a free nacho bar and a true theater setup with projector and 200" screen. The bar will be open and the tacos on the grill!!! This is a FREE event if you choose to watch the fights on our main showroom floor, and only a paid $10 ticket if you would like to watch the fights in our private VIP event space decked out with leather couches and free snacks...for UFC 233 we will be serving our VIP guests complimentary hot nachos. Our UFC Fight Nights are always a great time and always family friendly!